This time of year brings school stress that can impact brain health and behaviors in children and teens alike. It’s not uncommon for them to experience anxiety or discomfort around the end of a school year as they anticipate a change from routine and feel the stress of making the grades. The anticipatory anxiety around the transition to a new routine and the fear of failing makes the end of the school year a particularly difficult time for many students.For the last nine months, your child has had routine, formed relationships with his or her teachers and peers, and has had the safety in knowing what the next day will bring now. But now they have finals, farewells, and anxiety about their academic performance. 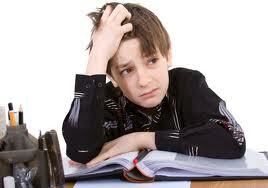 Many kids from elementary school, to high school seniors, suffer from test anxiety and fear of failure. The fear may be internal or come from outside cues, but as parents, you can help. Be honest with yourself. “Am I the contributor or supporter?” Some parents unwittingly heap stress on their kids by talking frequently about tests and sending the message that they measure their child’s worth in terms of grades and test scores. Some parents think that if they don’t push their kids, they are being irresponsible. But pushing them while they are stressed and anxious, instead of guiding and assisting them, will only create more anxiety. They need your support, not another teacher or coach. Help them relax. Lori Lite founder of Stress Free Kids, has great tools and free downloads for parents and teachers to reduce anxiety. She says “A powerful stress buster for test taking is positive self-talk. Anxiety can be lowered and confidence boosted with this simple technique.” Here are some examples of positive self-talk that can be used before and during tests. Make sure they are getting enough sleep. As parents, you can help your student reduce end of school stress by creating a calm environment, even at night. Encourage books shut and computer off by a reasonable hour, 1-2 hours before bed. Distract from their studies by doing something as a family (their brains aren’t going to forget the information). Read a book, play a game or watch a TV show together. Have a bedtime routine and try a guided bedtime relaxation to help get their mind off school and on to dreamland. If sleep is becoming an issue, where they are not getting the recommended hours for their age, it may be time to check in on their protocol and do a neurotransmitter test. This is imperative to their school performance but more importantly their mood and behavior. For more on the importance of sleep and the role it plays in your child’s mood click here. Make sure they are eating every 3-4 hours. When blood sugar gets out of balance focus and mood follow—fast! They are going to need good snacks and foods that fuel their brain. Aim to have protein with each snack and avoid junk food, dyes, and too many carbohydrates, as it will put your little one into foggy thinking mode. Coconut oil can be a great way to keep your blood sugar stable, just a spoonful after school can help your kiddo stay focused.